This entry was written by admin on March 19th, 2013. 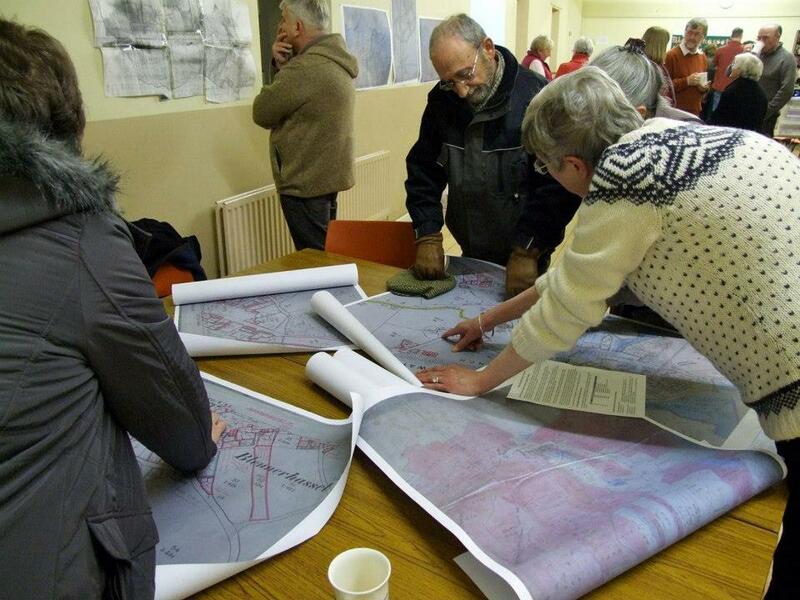 This successful event attracted more than 30 people who came to find out more about how to research the history of their homes and families using on-line resources, building features and local archives. Shirley Muir introduced the project, its funding from the Heritage Lottery Fund All Our Stories programme and the speakers who would be leading the evening’s events. She gave a quick update on the recently-completed archaeological magnetometry survey of the nearby Roman fort, explaining that the survey had added considerable detail to work done previously on part of the site and also that a previously unrecorded feature, adjacent to and possibly pre-dating the Roman works, had been detected in one corner of the main field. Further work is required to clarify what this find represents, but there are early indications that it may be an iron age shrine site. The first speaker was local resident Geoffrey Bremner who gave a quick introduction to his published work on the history of the village – Blennerhasset. Geoff explained a little about his research into the village school and the experimental agricultural project that took place at nearby Mechi Farm. The book provides a valuable background to anyone wanting to do his or her own, more detailed or personal study, and can serve as a very useful start point. Copies are still available from Bookcase in Carlisle and it may be possible, at some point, to make the book accessible in digital format from the new Blennerhasset project website. Peter Messenger, historic buildings expert, gave a presentation featuring examples from houses in the village, of ways of making an initial assessment of a building’s history from architectural features. In some cases there may well be date stones built into the inside or outside of a structure, although these do not necessarily match with the earliest phase of construction, some having been incorporated as part of later changes to the building. The height, shape and layout of a building, whether it is single storey or more, whether there is evidence of later extensions, whether it is a linear structure or one that has a more rectangular footprint and what materials were used in its construction are all important clues to its age and origin. Other evidence can also be very revealing, such as the size and shape and kind of openings made for windows and doors, as well as internal features, such as fireplaces, staircases and the layout of rooms. Bill Finlay, keen amateur historian, used examples from the internet on how to trace human histories through identifying buildings and who lived in them via the census records now available. Census information for the area is now on-line from 1841 to 1911 and more information is being gradually added over time. Bill also looked at a range of both free and commercial sites that can be accessed to trace family histories. He recommended trying out the free sites initially before spending money on the commercial versions; once a familiarity with how to use these resources has been gained, it may then be worthwhile moving on to other sites. Fact sheets relating to both Peter’s and Bill’s presentations are available here. Shirley thanked those who attended, the speakers and all who had helped in setting up the event, including the committee, Caroline Turner, who has carried out some initial village research that can help others make a start (and who organised the refreshments) and Mike Strickland for arranging free Wi-Fi access in the village hall for the evening. She also invited anyone who would like to share their own knowledge of local history or stories about their family, friends or past local events to submit this directly onto the website, which you can do here. 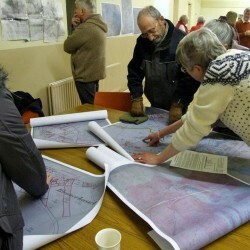 The meeting then split into smaller working groups where people were able to get more advice from the experts, to examine some of the images collected for the project, to look at a worked example of research carried out on one local house, to try out some of the internet sites, to have their own documents scanned for use in the project or just to chat about their own houses.